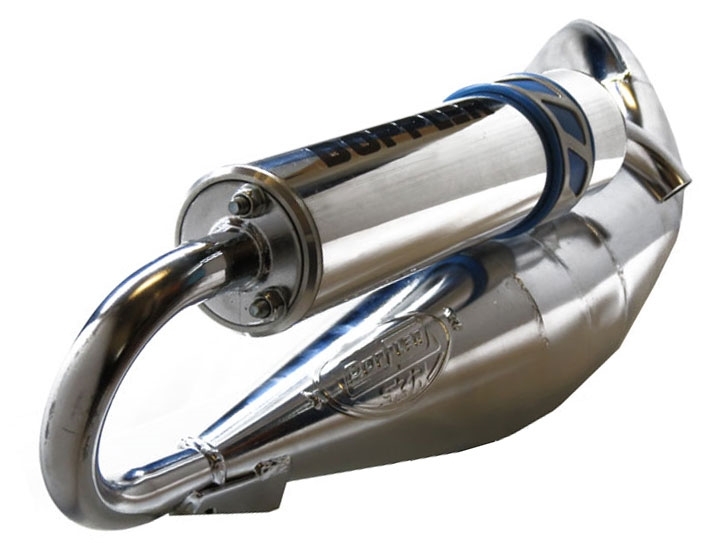 The Doppler S3R Chome Exhaust for Minarelli Engines has th epower to push and pull you to top end speed nopt found easily. A quality 70cc cylinder kit as well as fuel and air with a tuned CVT will get you top speeds of well over 50 with bottom end you better control not to loose control.
. Made from 12/10 high resonance sheet steel, rolled and then welded to produce maximum performance. High performance but also robust and reliable, mounted via an aluminium bracket and vibration dampening of proven quality. The design department has opted for a 260mm long silencer producing low noise. 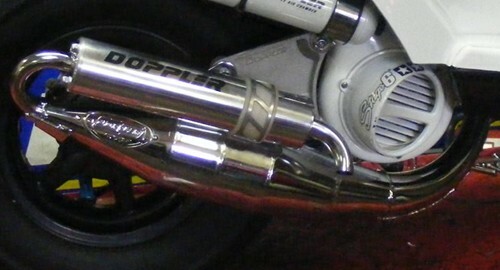 It is polished and stamped, as is incidentally the body of the exhaust. Both parts are fixed together with an anti vibration collar. Supplied with variator rollers.